The 21st century Chindon-ya san in New York City! This big band plays Japanese pop, rock, enka, anime, pre-war and post-war, Okinawan, and even Korean songs. They often creates a circle of bon-odori dance with the audience members involved with their mission "to make the world more happyfunsmile." Please visit happyfunsmile website and check out for their songs and gigs on schedule. 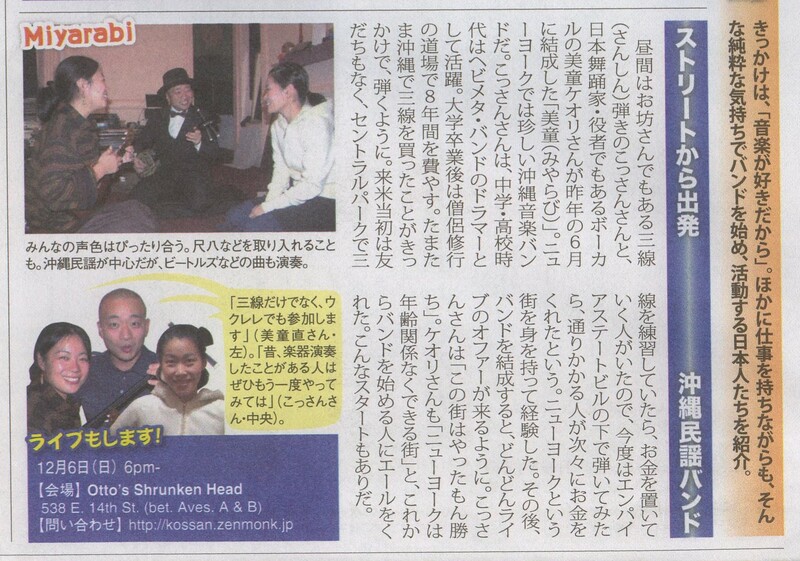 Kossan and beautiful children, Miyarabi plays all Okinawan songs from classic to the recent pop numbers. The sound of Sanshin will take you to an immediate trip to the southern islands of Japan. Request a song when you see him in NYC subway! Please visit Kossan's official websitefor gig schedule. Miyarabi appeared in the Talent Night for both days and performed Okinawan song medley! Other show included Samurai Sword Fighting, Faune Dance's Classic Gala, Yosakoi, Japanese Drum, Talent Night as well as Artists Booth and Food Booth. Where Eagles Dare Studio "Black Bird"
Kossan collaborates with various types of Japanese performers. Giri and Ninjo world of prewar Yakuza with a lone wolf Tokijiro on jorney struggling to quit the underworld. A master of popular literature and Kabuki's sewa-mono in the early Showa period (1926-1989), playwright Shin Hasegawa's laguage is collaborated with western guitar sound and wooden clapper in NY style.